The Aberdeen racer lost his drive in 2014 after a drink-driving conviction and had put any potential return to the championship to the back of his mind. 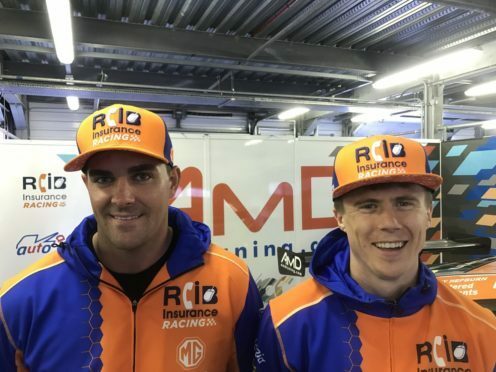 He replaced Ant Whorton-Eales, driving alongside fellow Scot Rory Butcher, at Rockingham for the AmD Essex team recently and will compete on home soil at Knockhill this weekend. His return may only be a short-term one, with no guarantees about a permanent return to BTCC. But Geddie has returned with a determination to make up for lost time and not let what has happened in the past dictate his future. Geddie said: “When I lost the opportunity last time I felt it was done with. It was hard but a lot of people don’t know the ins and outs of the story. I had to face the music at some stage. It was a sore point for me, so I didn’t watch any touring cars for a couple of years. “I feel like I’ve got a point to prove and it was going to be difficult to do that in my first race. If we have a strong weekend at Knockhill, then we can go prove that point. Following the incident in August 2014, Geddie was banned from the road for a year and dropped by United Autosports, after driving in their Toyota Avensis for the majority of the season. Focus switched to work, with Geddie a managing director at storage and inspection firm Independent Oilfield Services, and he spent some time racing in the Middle East over the winter in the Porsche GT3 Cup in Bahrain and the United Arab Emirates. It is a learning curve getting back behind the wheel of a front-wheel drive car again and Geddie is undecided over whether he would consider coming back to BTCC long-term. Geddie, a former British GT champion, said: “I hadn’t raced anything in about four years before I went to Dubai, so I didn’t know what standard I was at. “I was a lot quicker than I thought and there was a relaxed atmosphere around the championship. I’ve got the bug again. The problem is work isn’t slowing down and I need to weigh it up, if an offer comes.